Trying to live a successful life in this world can be like trying to compose a symphony in a battlefield. Imagine that all your life you’ve been crawling through a minefield of missed opportunities, bad decisions, and failed attempts. You are now lying wounded in the muddy foxhole of your present circumstances with the bombs of dysfunction and disappointment going off around you. Your many obligations wage a fierce frontal assault while the consequences of past decisions threaten to attack you on your flank. Most people live in a reactive state of self-preservation, self-medication, or self-indulgence, all with the same goal in mind: survival. Getting by, making ends meet, making it through the day. All of us are constantly nagged by financial, emotional, spiritual, and physical pressures. Those who bend to the stresses of today and only pay attention to their immediate needs run the catastrophic risk of never developing their Power of Vision. What about you? 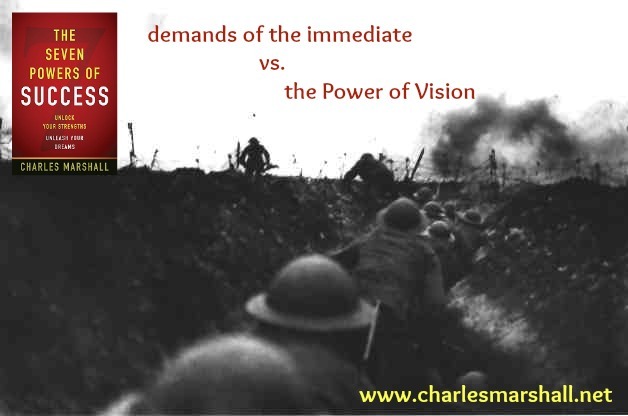 Do you allow the demands of the immediate to limit your vision? Do you let yourself be distracted by your most pressing needs or do you make time to investigate the possibilities of your future? In short, is the development of your Power of Vision a priority? Some Kidding Aside – Why should I choose?